R-star is a fiction which like term premiums for interest rate decomposition allows Economists to skate past reality and onto their econometric blackboards. If there was a neutral rate, which R-star (or R*) proposes to be, why would there be only one and what good would knowing its level today do? In a dynamic world, if you figure out where neutral is today it won’t be there tomorrow. In many ways, it is a straight up contradiction. Take something like forward guidance. Policymakers think that monetary policy is powerful but even so it takes some time to work through all the hidden economic processes, the beauty of Adam Smith’s invisible hand unknowable to professional and layperson alike. Thus, the central bank under expectations policy (there is no money in monetary policy these days) is forced to live in the future. But if monetary policy lags into the future, how then could they evaluate where monetary policy rates are in relationship to that future today? You aren’t really supposed to provide an answer for that question, largely because you aren’t meant to ask it. Jay Powell last week triggered the “Fed pause” scenario by making a lot of that little. Should the Fed pause on interest rates, why aren’t markets enthused over the prospect? After all, if “rate hikes” are the problem then fewer of them should help. But, as noted earlier, they aren’t really the problem. And that’s the problem. When Ben Bernanke, taking over for Alan Greenspan, paused in June 2006, over the next year and a few months the economy got better? No. It got worse because it wasn’t the federal funds rate that dictated anyone’s monetary direction. 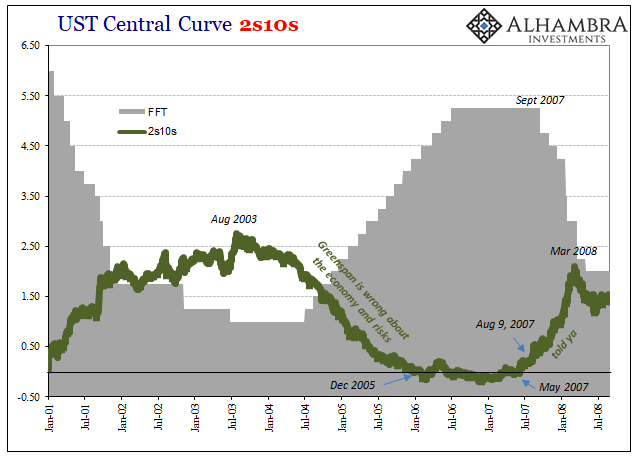 In fact, by the time the Fed reversed course in September 2007 it was already too late. Way too late. There is always someone, however, who will take it positively. This Fed pause coupled with now yield curve inversion has some people thinking back to the myth of bad news is good news. The legend of central central banks won’t die easily.